Even I am shocked... four new posts in one day?? Is it possible?!! I guess I'm not as busy as I thought... actually, I am. I'm just really good at procrastinating! First off, I posted a new bracelet! This one is so stunning ~ it is sure to get tons of compliments! Then I happened upon a trade thread in the forums. It's been a while since I've traded anything, so I browsed the wonderful shops and sent out a few convos. My first trade was with CrazyGirlBoutique ~ a really unique shop. 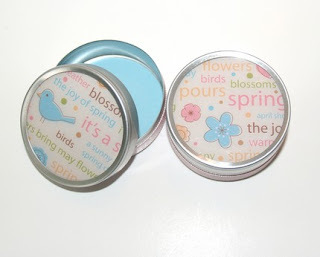 I just love these little gift tins I got ~ they're so cute!! Next, I traded for some jewelry ~ this cha-cha set is adorable! Though it was really hard to choose a favourite in jennysjewels. This is going to go so well with so much of my wardrobe... I wonder if there's any chance it will be here in time for my formal next Friday? It would be a perfect addition to my little navy dress! And my last trade was with Sheltie19. 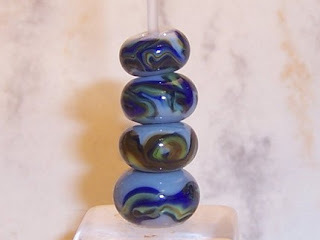 She make lovely lampwork beads, and I scored this gray swirl set. They are definitely going to make a lovely bracelet!! So that was my busy night. Now I'm really excited to get all my trades! I love getting mail!!! I am off to bed now so that I can (hopefully) get some more work done tomorrow! that's such a pretty bracelet! 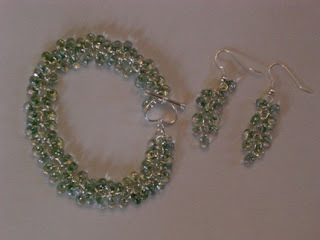 I really like the beads you used!